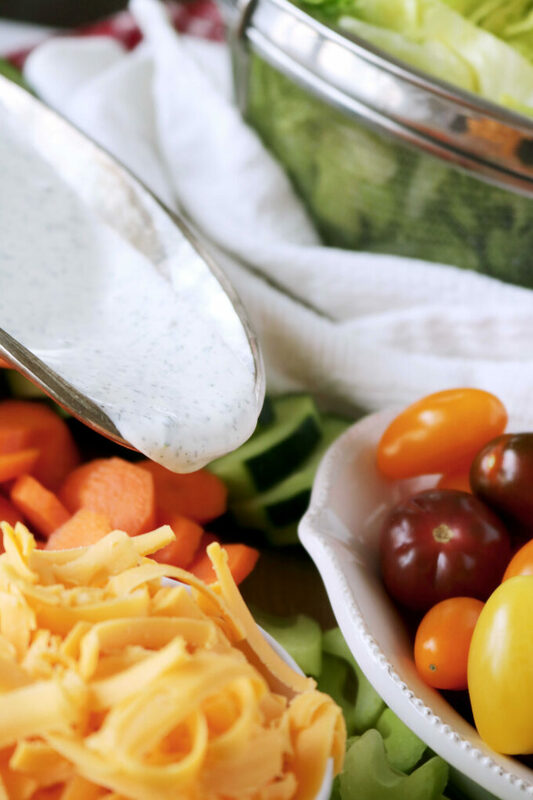 A quick and easy recipe for homemade ranch dressing, featuring mayonnaise, sour cream, minced garlic and a simple mix of dried and fresh herbs. Sometimes that pesky old scale rudely prompts me to eat less bread and more vegetables. I make my way to the grocery store with a “can-do” attitude and load up my cart with carrots, celery, cherry tomatoes, cucumbers and the like. I get home, I unload the groceries and proceed to wash, peel and cut. Alright. Now it’s time to munch. Mmmmmm…mmmm…hmmm…okay, I’m bored. Then my memory is flooded by a creamy white dressing, speckled with green and bursting with flavor, and I am reminded of how much better vegetables taste smothered in it. Don’t be mad at me whole foods people. I respect what you’re doing. Your willpower totally rocks my world. And, don’t get me wrong, nature did a pretty good job when it comes to food, and the Good Lord sure knew what He was doing when He created the garden…but He also knew what He was doing when He created the guy that created ranch dressing. So there’s that. Before we get into how to make ranch dressing (which is ridiculously simple by the way), let’s talk about what’s in it. WHAT IS THE BASE FOR HOMEMADE RANCH DRESSING? 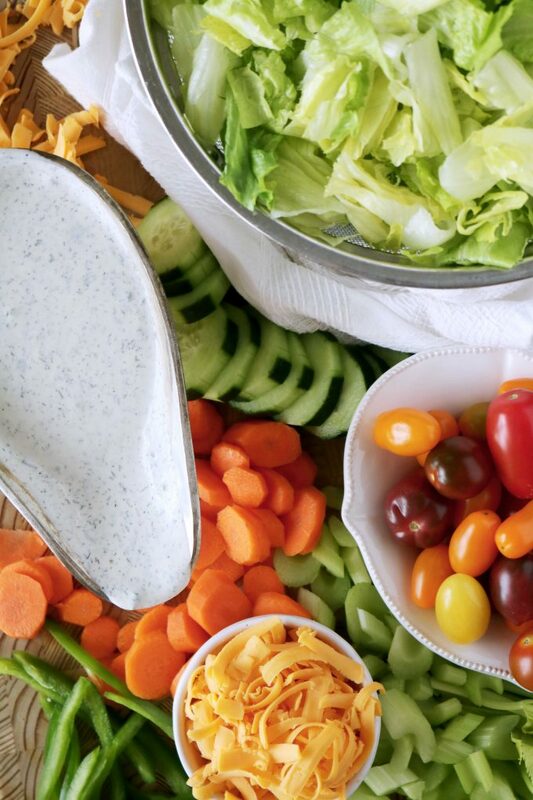 Ranch dressing begins with a base of mayonnaise, sour cream, milk, and vinegar. Thicker ranch dressings are heavier on the sour cream, thinner ranch dressings call for less sour cream and likely more milk as well. 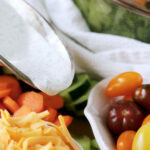 WHAT ARE THE HERBS IN HOMEMADE RANCH DRESSING? A mixture of garlic, spices, and herbs is what gives ranch dressing its signature flavor. The herbs and spices used for ranch dressing are parsley, chives, and dill. 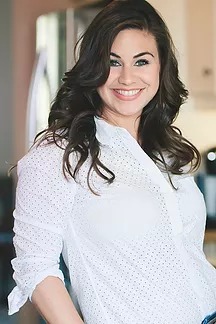 I’m typically of the mindset that fresh is best when it comes to food, however, there are a few herbs that just don’t tend to keep long in the refrigerator. Dill and chives are delicate herbs and wilt quickly. Buying a packet of fresh herbs, only to use a pinch seemed wasteful, and I found the dried version of each worked beautifully in a homemade ranch dressing. Fresh Italian parsley, however, holds up for as long as a week and a half in the refrigerator, can be used in countless recipes, and adds a fresh note to the dressing. 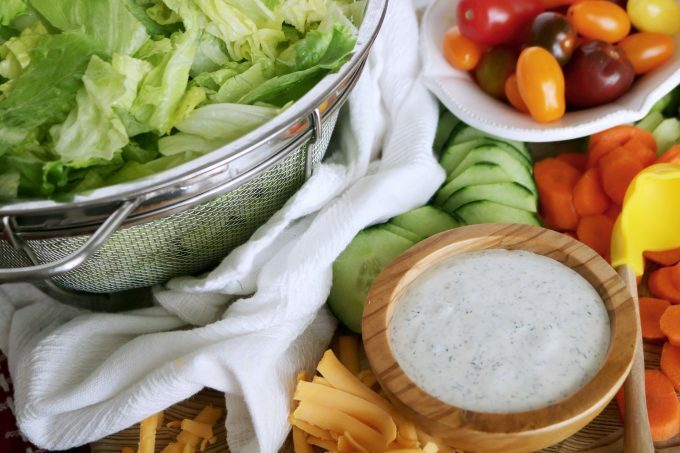 Ranch dressing is extremely easy to make. Get your chopping out of the way first, then set out all of your ingredients, a mixing bowl, measuring utensils, and a whisk. All the ingredients go into the bowl, and are whisked together, refrigerated until chilled — and guys, that is literally all there is to it. This recipe knocks that store-bought stuff plum out of the water. One taste, and you will never be lured toward that hidden valley ever again…no matter how conveniently located it is. Please, enjoy. Honey Mustard Sauce at home is just as good, if not better than your favorite restaurant’s! Perfect for both drizzling and dipping, this Honey Mustard Dressing Recipe is sweet, tangy perfection, and it all comes together in 2 minutes or less. Green Goddess Dressing comes together quickly in a blender and is made with creamy avocado and tangy buttermilk. You’ll find it featured in a simple and healthy Shrimp and Tomato Salad. Creamy Cilantro Lime Dressing is a healthy take on Ranch Dressing, made up of Greek yogurt and comes with a kick thanks to chipotle and lime. Use it to top Southwest Chopped Chicken Salad Tacos or any salad with a Southwest vibe. Lemon-Poppy Seed Dressing comes together fast with a quick mix of mayonnaise, honey, lemon juice, and poppy seeds. Use it on any number of salads, but it is particularly lovely on this Kale Broccoli Salad. Balsamic Dressing is tangy, a little sweet and way easier to make from scratch than you might think. Use it to top off Bruschetta Chicken Salad. In a small bowl, whisk ingredients together, cover, and chill for at least 1 hour before serving. Will keep for up to 10 days, as long as dairy expiration dates coincide with assembly time.